Cumberbatch) claiming he can save her. We then cut to a over-color saturated planet where the crew of the Enterprise is in the midst of a tense mission. I won’t spoil that except to say the effects are pretty spectacular and you get instantly sucked into the adventure. The best thing about this extended trailer is that is amps up the excitement and anticipation for the movie, while not revealing any of its many secrets. 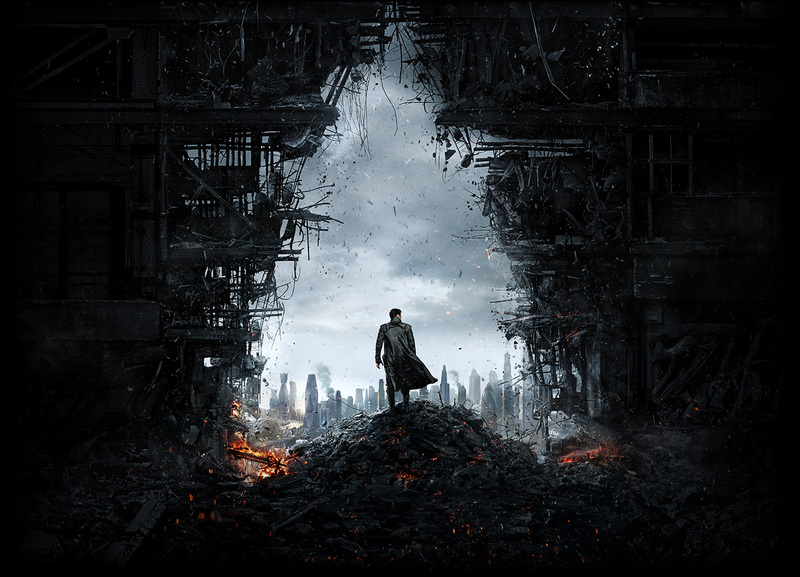 For example, Cumberbatch’s character is shrouded in secrecy. Production names him John Harrison, and we know he’s the villain of the piece. Beyond that nothing is confirmed in any way. Going online rumors persist that the character is, in actuality, Khan Noonien Singh- the psychotic genectically engineered villain from the original “Star Trek” series, and the main foil of “Star Trek II: The Wrath of Khan” originally played by Ricardo Montalban. As this Trek universe is a complete reboot of the original series, the possibility that this is Khan exists but no one is saying either way. But, between online rumors and a certain iconic shot appearing in the trailer the flames of speculation burn ever brighter. All in all, I do recommend seeking out this preview. If nothing else, it serves as a quick reintoduction the the new Trek universe. It’s fun, action packed, and intrigues rather than spoils. Also, let’s be honest, Chris Pine and Karl Urban (James T. Kirk and Leonard McCoy) in futuristic wet suits is an image that needs to be seen in IMAX.